It's become somewhat of a Halloween tradition that every year, at 12:01 am, November 1st, J and I run to the local Wal-Mart and buy bags and bags of discounted Halloween candy. We've maybe done this once. Maybe. 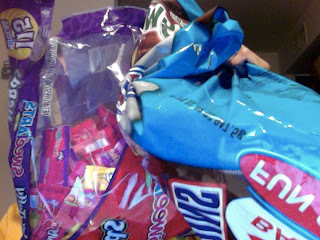 The truth is that we usually don't remember until November 1st, 7:00 pm and by then, absolutely all of the candy is gone. Can you believe? After being disappointed by Wal-Mart, we stopped at the HEB on our way home, just to see. Luckily, we came home with a huge back of Wonka candy (for $3.50) and a MASSIVE bag of chocolates for $5 :) It was absolutely wonderful. 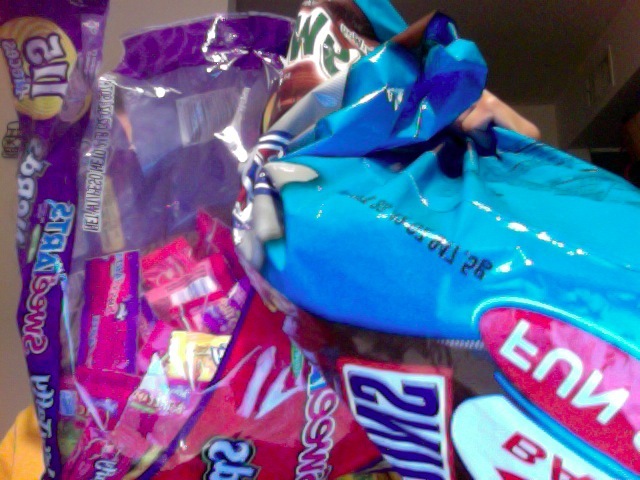 I know it's kind of a silly tradition, but it's always nice to have candy around for those stressful all-nighters.